and in doing so, our planet as well. This is my third album. My previous album, A Healing Journey: Words, Music & Sounds to Help You to Heal, was created to help release the fears, anger, and emotional pain preventing us from reaching those higher states. This album takes over where my last one left off. It is with great joy that I am presenting this music for your personal spiritual growth, fulfillment and enjoyment. The melodies were channeled through me emanating from a place that I can only describe to be a divine source, which I then orchestrated and performed. Most benefits will be derived while listening in a meditative state. The titles of the songs might suggest where your journey could take you. Hopefully it will facilitate a breakthrough in some small way helping you to expand your own enlightenment. An energy and sound healer with a sterling track record, Gene Krackehl makes ambient music that is energizing, cleansing, healing, tripped out, and above all, beautiful without being sentimental. 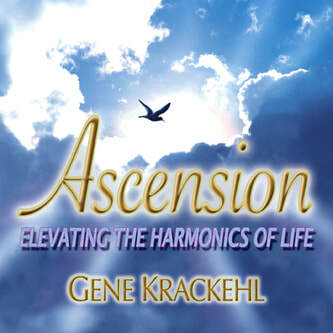 Ascension is an album designed for Elevating the Harmonics of Life, ideally to be heard in a focused state or deep relaxation or meditation as that's how Krackehl composed it "the melodies were channeled through me emanating from a place that I can only describe as a divine source," he says. Considering all the great praise he's received and work he's done to teach and heal others, Krackehl is clearly coming from a sound place of the heart, and you can hear it in every uplifting step of Ascension. The name of each track gives you an idea of its vibe and purpose. Chakra-tingling synthesizer squiggles and moody electric-piano notes come together in serpentine forward-flow for "Moving Through," while the perception-expanding drones of "All Is Forgiven" move outward like a widening spiral. Droning chords build until a drowsy and vaguely elegiac melody of disembodied voice, horns, and gentle bells build up and out over the top. Throughout Ascension, the mixture of healing tonality, hushed spiritual reverence, and emotional melodies create the holy rapture of a cathedral one moment and the open sky over the mountains in the next, showing in the end that there really is no difference between them. Krackehl used to play guitar in bands in the 1960s, and you can hear a bit of old-school musicality at work here. His perfect past experience aids his current work of melding healing sound and musical composition, as in the melancholy English horns and electric piano of "Unconditional Presence." Patients of Krackehl's healing practice have been known to leave sessions bathed in grateful tears, and you can feel that gratitude and emotional release all through Ascension. The music leads you gently by the hand out of the cave of your own limiting perceptions and into the pure sunshine of the universal self.